In homage to the legendary 19th century Jewish violinist “Stempenyu” (Yosele Druker), Steven Greenman (violinist/vocalist/composer) has created a masterpiece of original Jewish spiritual melodies with Stempenyu’s Neshome (“Stempenyu’s Soul”). 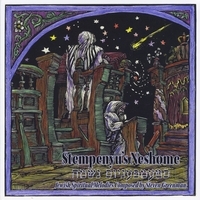 Stempenyu’s Neshome delves deep into the heart of the Ashkenazic Jewish soul and adds new gems to the traditional collection of East European Jewish spiritual music. Steven has composed powerfully moving pieces of exquisite beauty; cantorially-inspired masterpieces that rival those performed by the greatest Jewish cantors; sacred religious hymns of solemn beauty; hard-driving virtuosic tunes of ecstatic exultation; and meditative melodies that reach for the infinite and contemplate the mysteries of the universe. Steven’s compositions express a great love that can be felt and experienced by all of humanity. Stempenyu’s Neshome takes the listener on a journey of spiritual reflection, inner contemplation, religious awakening, and meditative travels of the heart and soul.